Blender's realtime physically based renderer. Quer (Querrr) added a comment to T57752: EEVEE and backlighting. Lawrence Teng (Lteng) added a comment to T57752: EEVEE and backlighting. Yeah it is sort of an attempt to "tame" the specularity. It's a little bit different from turning spec off completely. I had it set to zero to just show the effect, but it does need to be set close to it. Anyway this is not really a "fix", just me trying to cheat and attempt some workarounds until the issue really gets addressed. I did find in the end that this cheat only works for certain lighting situations....oh well. Frederick Burbidge (Interference) added a comment to T57752: EEVEE and backlighting. I tried a few things as a makeshift workaround and found that plugging the layerweight node in the specular of the principled shader provides a bit of a "relief" even if not too perfect. It sort of temporarily "covers" up the blown out bleed through, at least until the bug gets sorted out eventually. Have not tried this on more complex geometry / scenes and I don't know if this will drastically affect specular highlights in general,, but I suppose Eevee is not really for super-realistic renders so may be able to get away with this for now. Sebastian Parborg (zeddb) merged T63627: Light Leak between normal shadows and contact shadows in Eevee into T57752: EEVEE and backlighting. Clément Foucault (fclem) closed T63377: "Principled Volume" node not working anymore in EEVEE. as Resolved by committing rB8d3af588a237: Fix T63377: "Principled Volume" node not working anymore in EEVEE. Philipp Oeser (lichtwerk) assigned T63601: Eevee does not respect Alpha Transparent setting in Rendered Viewport shading mode with an Environment Texture (HDRI) as the background to Clément Foucault (fclem). Philipp Oeser (lichtwerk) triaged T63601: Eevee does not respect Alpha Transparent setting in Rendered Viewport shading mode with an Environment Texture (HDRI) as the background as Confirmed, Medium priority. Philipp Oeser (lichtwerk) merged T63532: EEVEE Volume-Lighting does not work anymore at Blender 2.80b (build from 10. 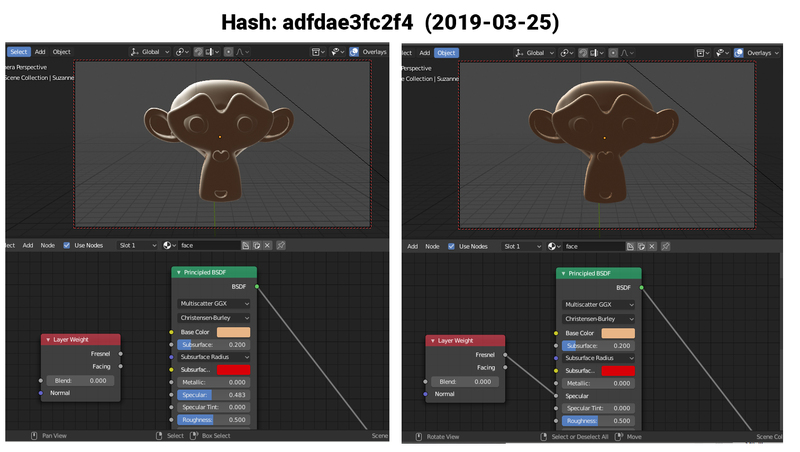 April 2019) into T63377: "Principled Volume" node not working anymore in EEVEE..
Philipp Oeser (lichtwerk) closed T63464: Multi UV Maps limited to three with eevee. as Resolved by committing rB87f07af737cd: Fix T63464: Multi UV Maps limited to three with eevee. Philipp Oeser (lichtwerk) added a revision to T63464: Multi UV Maps limited to three with eevee. : D4672: Fix T63464: Multi UV Maps limited to three with eevee. Philipp Oeser (lichtwerk) claimed T63464: Multi UV Maps limited to three with eevee..
Ahmad Bilal (SomeAB) added a comment to T63377: "Principled Volume" node not working anymore in EEVEE..
yes, I have checked on my side. That workaround is working in 009dbc2bc9fb . Thanks for pointing out. why is this required (Tysa) added a comment to T63377: "Principled Volume" node not working anymore in EEVEE..
Just so it is helpful to track the cause, I'm reposting the version details I posted in the other thread (T63468). Brecht Van Lommel (brecht) merged T63468: Volumetrics broken in current compiled version into T63377: "Principled Volume" node not working anymore in EEVEE..
Jeroen Bakker (jbakker) merged T63437: Eevee - No Principled Volume & Volume Scatter previews in render&viewport into T63377: "Principled Volume" node not working anymore in EEVEE..
Jeroen Bakker (jbakker) merged task T63437: Eevee - No Principled Volume & Volume Scatter previews in render&viewport into T63377: "Principled Volume" node not working anymore in EEVEE..
jeremy joe (blenderjoe) renamed T63437: Eevee - No Principled Volume & Volume Scatter previews in render&viewport from Eevee doesn't show any volume texture preview in render&viewport to Eevee - No Principled Volume & Volume Scatter previews in render&viewport. jeremy joe (blenderjoe) updated the task description for T63437: Eevee - No Principled Volume & Volume Scatter previews in render&viewport. jeremy joe (blenderjoe) added projects to T63437: Eevee - No Principled Volume & Volume Scatter previews in render&viewport: Eevee, BF Blender: 2.8. Michael Soluyanov (crantisz) renamed T63424: Normal map node doesn't works with curve objects (or any object without UVs) in EEVEE from Normal map node doesn't works with curve objects in EEVEE to Normal map node doesn't works with curve objects (or any object without UVs) in EEVEE. Michael Soluyanov (crantisz) added a comment to T63424: Normal map node doesn't works with curve objects (or any object without UVs) in EEVEE. The issue here is not with curve objects, you can convert the curve object to mesh and the issue is still present. Sebastian Parborg (zeddb) assigned T63424: Normal map node doesn't works with curve objects (or any object without UVs) in EEVEE to Clément Foucault (fclem). Brecht Van Lommel (brecht) merged T63423: Multiple Principled Volume shader failures w/ Eevee into T63377: "Principled Volume" node not working anymore in EEVEE..
Sebastian Parborg (zeddb) assigned T63405: Object texture coordinate updates in viewport only if material has animation data to Sergey Sharybin (sergey). I'm guessing this is a depsgraph issue. Oh this is just a temporary workaround (at least for me in some situations) to address the bleeding back light. Right now some lighting scenarios in Eevee with backlight and SSS shader will leak in backlight and fail to cast shadows. It seems to be a complicated kind of bug and may take a bit longer to fix. Michael Soluyanov (crantisz) added a project to T63424: Normal map node doesn't works with curve objects (or any object without UVs) in EEVEE: Eevee. Brecht Van Lommel (brecht) closed T63210: Glow points appear during the use of "bloom" in eevee render output as Archived. Closing due to lack of information to investigate the issue, we can reopen the report if all the required information is provided. Brecht Van Lommel (brecht) raised the priority of T63377: "Principled Volume" node not working anymore in EEVEE. from Confirmed, Medium to Confirmed, High. Sebastian Parborg (zeddb) triaged T63376: Eevee: Plane with reflection plane rendered as transparent (alpha=0) as Normal priority. Your GPU is sadly EOL (end of life) and will not receive any more updates. So this driver bug you are experiencing will never be solved. I don't know if there is much we can do on our side. Brecht Van Lommel (brecht) added projects to T63376: Eevee: Plane with reflection plane rendered as transparent (alpha=0): BF Blender, Eevee. Michael Soluyanov (crantisz) added a project to T63405: Object texture coordinate updates in viewport only if material has animation data: Eevee. LazyDodo (LazyDodo) added a comment to T63377: "Principled Volume" node not working anymore in EEVEE..
sorry @LazyDodo (LazyDodo) , first time posting. i updated the main post aswell with everything we figured out so far, hope thats okay.